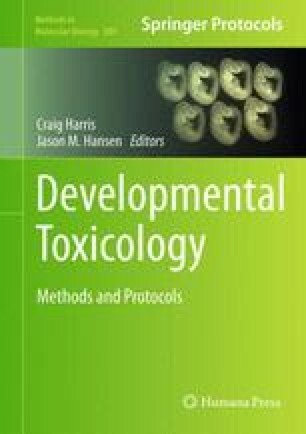 Oxidative stress has been recognized as a contributing factor in the toxicity of a large number of developmental toxicants. Traditional definitions of oxidative stress state that a shift in the balance between reduced and oxidized biomolecules within cells, in favor of the latter, result in changes that are deleterious to vital cell functions and can culminate in malformations and death. The glutathione (GSH)/glutathione disulfide (GSSG) redox couple has been the traditional marker of choice for characterization of oxidative stress because of its high concentrations and direct roles as antioxidant and cellular protectant. Steady state depletion of GSH through conjugation, oxidation, or export has often been reported as the sole criteria for invoking oxidative stress and a myriad of associated deleterious consequences. Numerous other, mostly qualitative, observations have also been reported to suggest oxidative stress has occurred but it is not always clear how well they reflect the state of a cell or its functions. Our emerging understanding of redox signaling and the roles of reactive oxygen species (ROS), thiols, oxidant molecules, and cellular antioxidants, all acting as second messengers, has prompted a redefinition of oxidative stress based on changes in the real posttranslational protein thiol modifications that are central to redox regulation and control. Thiol-based redox couples such as GSH/GSSG, cysteine/cystine (cys/cySS), thioredoxin-reduced/thioredoxin-oxidized (TRX(red)/TRX(ox)) form independent signaling nodes that selectively regulate developmental events and are closely linked to changes in intracellular redox potentials. Accurate assessment of the consequences of increased free radicals in developing conceptuses should best be made using a battery of measurements including the quantitative assessment of intracellular redox potential, ROS, redox status of biomolecules, and induced changes in specific redox signaling nodes. Methods are presented for a determination of ROS production, soluble thiol oxidation, redox potential, and a proteomic approach to evaluate the thiol oxidation state of specific proteins.